There are numerous challenges in supply and logistics chain management. These are risk management and optimization. The balance must be achieved between the inventory, time and lowering costs to prevent disruptions in the supply chain while remaining competitive, and this can be extremely difficult. The world of wine transport is always in flux regarding international transport, the product is fragile, and the value high. The United States consumes more wine than any other country, including Italy and France. According to the Wine institute the consumption in the United States is approximately 779 million gallons a year. For this reason, it as an incredibly desirable target market for the domestic and foreign wine producers. Individuals all over the world trade 1.5 to 2 billion liters of wine annually. Transportation and logistics are critical for transporting the product overseas. Sometimes wine is shipped in a bulk tank, or it is bottled at the winery. There are numerous aspects that must be taken into consideration because bulk wine trade shipped 1.24 billion liters in a ten year period, and brought in 560 million. Wine is sensitive to the temperature, including extreme humidity, cold, heat and thermal fluctuations. Bottled wines are impacted by everything from the transit to the labels to the packaging. The owners of the wine must take the seasonality and geography of the supply chain into consideration to evaluate any risks. They may choose to ship with refrigerated or dry containers. The wine shippers can make better decisions regarding the routes chosen by analyzing the historical data regarding humidity, temperature and shipping routes. The effects of extreme humidity and temperatures in dry containers can be reduced with the use of protective foil designed to fit inside the dry containers and protect the wine. This foil mitigates the risks without the expense of using a refrigerated shipping container, and sacrificing the size of the load. Wine shippers must remain compliant with all government regulations. This includes maritime law protocols, amendments and United States safety laws. If the exact requirements are not fulfilled, orders can be delayed, containers can be detained at the port terminals, and non-compliance penalties and fines can be charged. When a new regulation goes into effect, the rules are not always clear regarding the enforcement and application. The weight of each shipment must be calculated, verified, and sent to numerous destinations. Understanding the wine transport regulations is critical to meeting compliance, making deadlines and avoiding expensive fines. 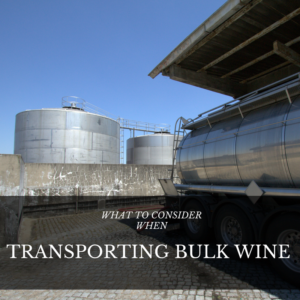 The only alternative to shipping bottled wine is a bulk tank. The two types of bulk tanks are the Flexitank and the ISO Tank. The Flexitank consists of fitting plastic, disposable bags into a twenty-foot container. Although the Flexitank transport is generally used once, it is capable of being re-used. The components of the bags have variations, and this depends on the specific product transported. The newest systems are made from polyethylene, and EVOH, or ethylene vinyl alcohol copolymer is used for a barrier material to prevent the quality from being affected. The design of the bags are effective against material that can taint the wine including naphthalene. The ISO tank transport consists of steel tanks designed to be reusable. These tanks fit into a standard truck, and are easily transferred to either sea or rail transport. The type of tank will hold 26,000 liters, and are robust and reusable because they are additionally capable of transporting hazardous materials. It appears the quality of the wine is better preserved when shipped after being bottled, while the benefit of bulk wine hauling is simply the ability to increase the amount of wine transported. The belief of the producers of premium wine is their brands may be affected if the consumers have a negative perception of the quality. This fear is founded because good brand positioning can require numerous years to achieve, and be lost in a matter of minutes. This brings up the questions as to which type of transport is better for the quality and quantity of a business. In 2008, the results from a report performed by Wrap concluded unless a wine has been produced with longevity and aging as the goal, the minute wine is bottled, the deterioration process begins. This is when the shelf life starts. Bottling is effectively deferred when wine is bulk shipped, and this is beneficial for the rotation and stock levels of the retailer. The entire shelf life is in the country the wine is being sold instead of partially on the transport, so the shelf life is increased. Since the standard containers hold large volumes of wine, they are not the appropriate container if a wine is sold in a much smaller volume. A lot of funding has been invested by the wine industry in R&D, or research and development for any risks regarding bulk wine transport. The effects of temperature, fermentation and oxygen have been studied to ensure the best possible management of quality traceability. Scorpex Wine wrote and published a paper documenting many of the risks of bulk shipping have been either reduced or eliminated. When the proper methods for bulk shipping are implemented, all risks can be mitigated. Kan-Haul is a leader in bulk liquid transport for domestic and international for over 30 years. For reliability, safety and cost saving use a Flexitank carrier for shipping wine. Contact us today to take care of your wine transportation requirements.